The canned lion hunting industry has grown to host 8000 lions now in captivity. The lives of these animals begins by the cruel removal of the cub, usually at 3 days old, from its mother. It ends in a violent death. Read below how you can make a difference. Did you know that when you pet a lion cub you are killing it? 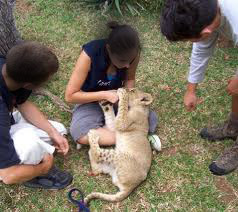 Learn why you should not pet lion cubs. The sinister side of walking with lions, be informed. A 'sport' with only one player in the game. This is not conservation. A growing industry that makes old bones as valuable as rhino horn. Be aware. If you go to our What you can do page you can see all the government addresses. Please email and ask for a ban on breeding our lions for the bullet and abolish the canned hunting industry.